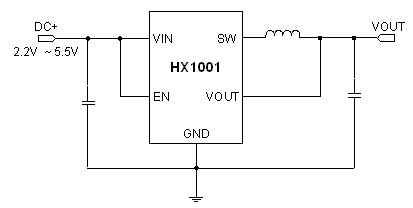 The HX1001 is high efficiency synchronous, PWM step-down DC/DC converters working under an input voltage range from 2.2V to 5.5V. This feature makes the HX1001 suitable for single Li-Lon battery-powered applications. 100% duty cycle capability extends battery life in portable devices, while the quiescent current is 200μA with no load, and drops to <1μA in shutdown. The internal synchronous switch is desired to increase efficiency without an external Schottky diode. The 1.0MHz/1.4MHz switching frequency allows the using of tiny, low profile inductors and ceramic capacitors, which minimized overall solution footprint. The HX1001 converters are available in the industry standard TSOT/SOT-23-5L power packages (or upon request).